1. surgical use of a tampon. 2. pathologic compression of a part. cardiac tamponade compression of the heart due to collection of fluid or blood in the pericardium. It may be either chronic or acute. Chronic cardiac tamponade occurs when fluid slowly enters the pericardial sac, allowing time for the membrane's expansion to accommodate the fluid, which can be as much as 1 liter. This gradual filling may or may not produce changes in cardiac hemodynamics. However, if there is rapid filling of the pericardial sac, as little as 200 ml can precipitate a life-threatening emergency. The ultimate effect of cardiac tamponade is reduced cardiac output and inadequate tissue perfusion. Causes of acute cardiac tamponade include pericarditis with effusion of serosanguineous fluid into the sac, and either surgical or accidental trauma with leakage of blood into the sac. Occasionally, anticoagulant therapy can lead to extensive bleeding around the heart and cardiac tamponade. Excessive fluid within the pericardial sac causes pressure against the cardiac structures, interferes with ventricular and atrial filling, and compromises blood supply to the myocardium via the coronary vessels. These conditions occur because of the following events: The compressed atria cannot fill as they normally would and so less blood is available for the ventricles; thus preload (the volume of blood in the ventricles at the end of diastole) is reduced. Ventricular filling is further impaired by compression of the ventricles. As pressure within the ventricles rises because of tamponade, pressure differences between the atria and ventricles are reduced, causing the valves between the two chambers to close before the ventricles have had time to fill completely. Increasing pressure within the heart chambers and in the pericardium impinges on the coronary arteries and veins, reducing blood supply to the myocardium, slowing contractility, and further reducing cardiac output. Clinical features of cardiac tamponade include increased central venous pressure, falling arterial blood pressure, tachycardia, faint or muffled heart sounds, a narrowing pulse pressure, and an exaggerated inspiratory fall in systolic blood pressure (pulsus paradoxus). Hypoxia of cerebral tissues can produce confusion, restlessness, agitation, panic, and a sense of impending doom. Peripheral hypoxia is signaled by changes in the color, temperature, and excessive sweating. Diagnosis can be confirmed by echocardiography and other radiologic studies. However, if the situation is acute, these tests cannot be done without endangering the life of the patient; thus diagnosis must be based on clinical findings. Once tamponade is suspected, fluids are administered and a pericardiocentesis is done to remove the compressing fluid. Pericardiocentesis is performed to remove compressing fluid in cardiac tamponade. From Polaski and Tatro, 1996.
, tamponage (tam'pŏ-nād', tam'pŏ-nij), Avoid the mispronunciation tam-pō-nahd'. 1. Pathologic compression of an organ. balloon tamponade esophagogastric tamponade by means of a device with a triple-lumen tube and two inflatable balloons, the third lumen providing for aspiration of blood clots. cardiac tamponade compression of the heart caused by increased intrapericardial pressure due to collection of blood or fluid in the pericardium. 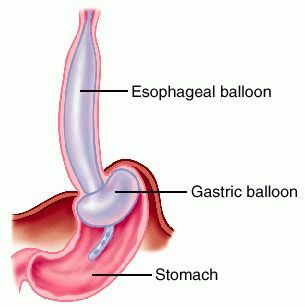 esophagogastric tamponade the exertion of direct pressure against bleeding esophageal varices by insertion of a tube with a balloon in the esophagus and one in the stomach and inflating them. Esophagogastric tamponade, using Sengstaken-Blakemore tube. stoppage of the blood flow to an organ or a part of the body by pressure, such as by a tampon or a pressure dressing applied to stop a hemorrhage or by the compression of a part by an accumulation of fluid, such as in cardiac tamponade. Cardiology See Balloon tamponade Medtalk A pathologic plugging of an organ–eg, cardiac tamponade, caused by massive accumulation of pericardial fluid, resulting in a mechanical limitation of organ function. See Cardiac tamponade. 1. Pathologic compression of a joint. 2. The insertion of a tampon. 2. The pathological or intentional compression of a part. A life-threatening condition in which elevated pressures within the pericardium impair the filling of the heart during diastole. Cardiac tamponade may result from injuries to the heart or great vessels, from cardiac rupture, or from other conditions that produce large pericardial effusions. If fluid accumulates rapidly, as little as 150 mL can impair the filling of the heart. Slow accumulation, as in pericardial effusion associated with cancer, may not produce immediate signs and symptoms because the fibrous wall of the pericardial sac can gradually stretch to accommodate as much as 1 to 2 L of fluid. 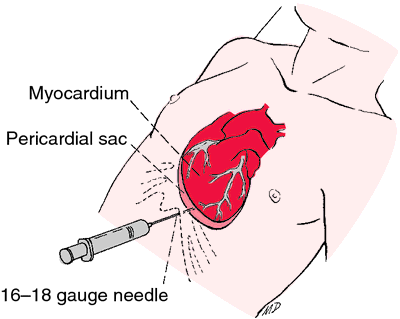 Cardiac tamponade may be idiopathic (Dressler syndrome) or may result from any of the following causes: effusion (in cancer, bacterial infections, tuberculosis, and, rarely, acute rheumatic fever); hemorrhage from trauma (as from gunshot or stab wounds of the chest, perforation by catheter during cardiac or central venous catheterization, or after cardiac surgery); hemorrhage from nontraumatic causes (as from rupture of the heart or great vessels, or anticoagulant therapy in a patient with pericarditis); viral, postirradiation, or idiopathic pericarditis; acute myocardial infarction; chronic renal failure; drug reaction (as from procainamide, hydralazine, minoxidil, isoniazid, penicillin, methysergide, or daunorubicin); or connective tissue disorders (such as rheumatoid arthritis, systemic lupus erythematosus, rheumatic fever, vasculitis, and scleroderma). Classic signs of tamponade include persistent hypotension despite fluid bolusing, muffled heart sounds, distended jugular veins, and pulsus paradoxus (a drop in systolic blood pressure of more than 10 mm Hg on inspiration). Cardiac tamponade is suggested by chest radiograph (slightly widened mediastinum and enlargement of the cardiac silhouette), ECG (reduced QRS amplitude, electrical alternans of the P wave, QRS complex, and T wave and generalized ST-segment elevation), and pulmonary artery pressure monitoring (increased right atrial pressure, right ventricular diastolic pressure, and central venous pressure). It is definitively diagnosed with echocardiography, or MRI or CT of the chest. Pericardiocentesis (needle aspiration of the pericardial cavity) or surgical creation of a pericardial window dramatically improves systemic arterial pressure and cardiac output. In patients with malignant tamponade, a balloon pericardiotomy (a balloon-aided opening in the pericardium) may be made. The patient is assessed for a history of disorders that can cause tamponade and for symptoms such as chest pain and dyspnea. Oxygen is administered via nonrebreather mask, and intravenous access is established via one or two large-bore catheters for fluid resuscitation. Airway, breathing, circulation, and level of consciousness are closely monitored. If the patient is unstable, he or she requires arterial blood gas analysis and hemodynamic monitoring and support. Prescribed inotropic drugs and intravenous solutions maintain the patient's blood pressure, and oxygen and ventilatory support are administered as necessary and prescribed. Pain is assessed, and appropriate analgesia is provided. The patient is prepared for central line insertion, pericardiocentesis, thoracotomy, or other therapeutic measures as indicated; brief explanations of procedures and expected sensations are provided; and the patient is reassured to decrease anxiety. The patient is observed for a decrease in central venous pressure and a concomitant rise in blood pressure after treatment, which indicate relief of cardiac compression. If the patient is not acutely ill, he or she is educated about the condition, including its cause and its planned treatment, e.g., by surgery to place a pericardial window. The importance of immediately reporting worsening symptoms is stressed. The patient is followed with repeat echocardiography and chest x-rays as deemed necessary. Compression of nasal blood vessels to stop bleeding. Obstruction to the blood flow to or through and organ by external pressure. The term is applied most commonly to compression of the heart, usually from a collection of fluid in the pericardial sac, as in PERICARDITIS or cardiac injury. This prevents normal heart filling and leads to breathlessness and sometimes collapse from reduced heart output. Fluid can be withdrawn through a needle. 2. Act of inserting a tampon. 2. pathological compression of a part. compression of the heart due to collection of fluid or blood in the pericardial sac. Causes interference with heart action and subsequent sudden death or congestive heart failure. 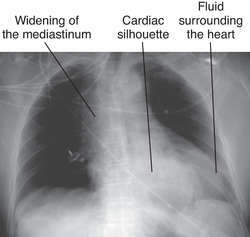 The heart shadow on radiography is enlarged, the heart sounds on auscultation are muffled.